Long known as a plaintiff’s law firm, Krupnick Campbell handles complex automotive, aviation, medical malpractice, products liability, admiralty, wrongful death and personal injury cases. In recent years, the company’s clients have expanded to include corporations and sovereign governments as well. The firm’s partners are board-certified in civil trial law, and leaders in The Florida Bar, the Academy of Florida Trial Lawyers, Association of Trial Lawyers of America and many other organizations. They are also active volunteers in the community, raising money for medical research and many charitable causes. A native of Cleveland, Krupnick started his legal career as an attorney for Ohio Bell, but disliked the office squabbling. “I came home from a workers’ compensation hearing in the snow and sleet, talked things over with my wife Elaine and decided to move to Florida,” he recalls. After a year, Walsh began giving Krupnick insurance subrogation cases. Krupnick won his first 17 jury trials with total recoveries for his clients of around $30,000, and his courtroom career was on his way. In 1974, Krupnick founded his own firm dedicated solely to the representation of injured persons. Walter G. “Skip” Campbell, Jr. was the first lawyer hired, and a year later the firm became known as Krupnick & Campbell. In the 1970s and ‘80s, Krupnick was a pioneer in products liability cases, and became one of the first Florida attorneys to become board certified in civil trial law. He has obtained more than 135 verdicts and settlements of $1 million or more, including $16.5 million jury award in an automobile product defect case, the largest personal injury verdict in the country for a single claimant at the time. In his career, Campbell has tried more than 800 cases, including 28 trials in one year alone. “I remember one day, when my cases were first, second and third on the judge’s calendar,” he says. Along with his legal career, Campbell has devoted much of his time to public service. He was elected to the state Senate in 1996, and represented northern Broward County for ten years. This fall, he returned to public office after being elected mayor of Coral Springs. For instance Krupnick has loaned the keys to his house in the Florida Keys to several partners after their marriages – with no divorces among them. On a sadder note, a plaque in the office honors the memory of associate Mark R. Giuliani who drowned in 2013 after successfully rescuing two young children caught in a rip current off the Palm Beach County coast. One of the first new members of the Krupnick Campbell “family” was Kevin Malone, who joined the firm and launched his career in the late 1970s. Since then, his accomplishments include representing more than 200 farmers against E.I. DuPont de Nemours and Company, Inc. in regard to its fungicide Benlate®, and after two successful trial verdicts, achieved settlements for his clients in excess of $200 million. Thomas Buser joined in 1982 followed by Slama in 1984. Both became successful trial attorneys and active leaders in legal associations. Scott Liberman, who joined the firm in 1993, focuses on medical malpractice, nursing home malpractice, product liability, personal injury, and wrongful death cases. Hancock began his career in 1975 as assistant state attorney and later served as chief of Broward County’s Homicide Division, where he prosecuted some of South Florida’s most famous murder trials. The television movie, “Murder or Mercy” was based on one of his cases. 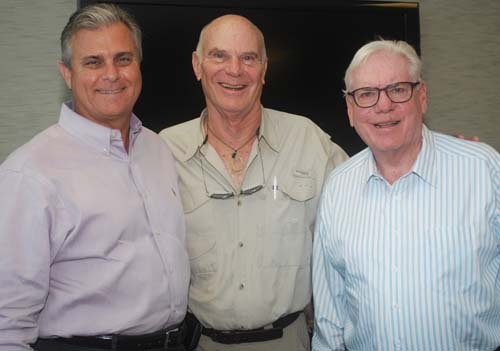 “I consider it a privilege to be here with Skip and Jon,” says Hancock, who became a partner in 1989 and handles automotive, aviation and some types of business cases. While most of the firm’s cases involve individual plaintiffs, Krupnick Campbell also represents foreign governments in litigation in the United States. Partners Malone and Carlos Acevedo have represented the sovereign interests of more than 25 nations in the past 15 years, in sensitive large-scale financial matters.